Leading organizations are separating themselves from the pack by deploying big data analytics to gain the most insight from customer data generated across all channels, including social media. The broader, deeper view of data helps them increase customer loyalty, decrease marketing costs and raise ROI. 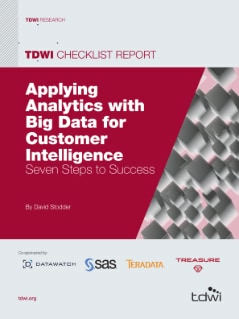 Now in this report by TDWI, you’ll learn seven sound steps that can help your organization become more customer centric by using big data in smarter ways. The report includes ways big data can help you sharpen social media strategies, improve real-time customer interaction and engagement, reduce customer attrition and gain a 360 degree view of customers.